I love to cook and bake and more so as I have two boys who love helping me in the kitchen. Now owing two Spaniels I had no reason why I couldn’t bake for them or even with them as Spaniels are always around where there is food. With my dogs Milly and Charlie being on Instagram I get to find all different companies and every now and then this company came up so I thought I would take a look as Milly’s 1st birthday was coming up. 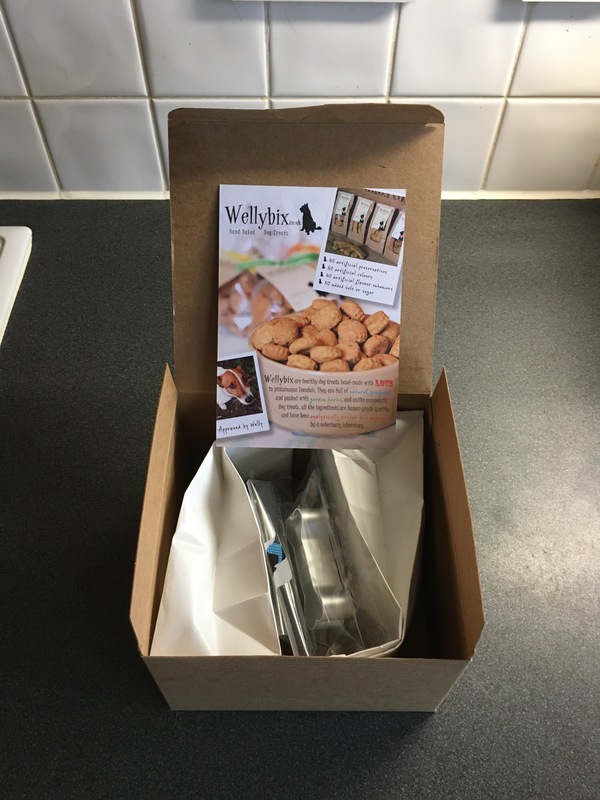 The company I’m talking about was set up by Alison and her Jack Russell Welly, she started baking treats for her dog and then she started to sell them to local hotels and cottages where dogs were allowed and now she has her treats in farm shops and a few pets shops near her but she also has her online shop http://www.wellybix.co.uk When I took a looked I was faced with so many lovely sounding homemade biscuits, so of course I had to order a couple of bags of which were freshly made to order. 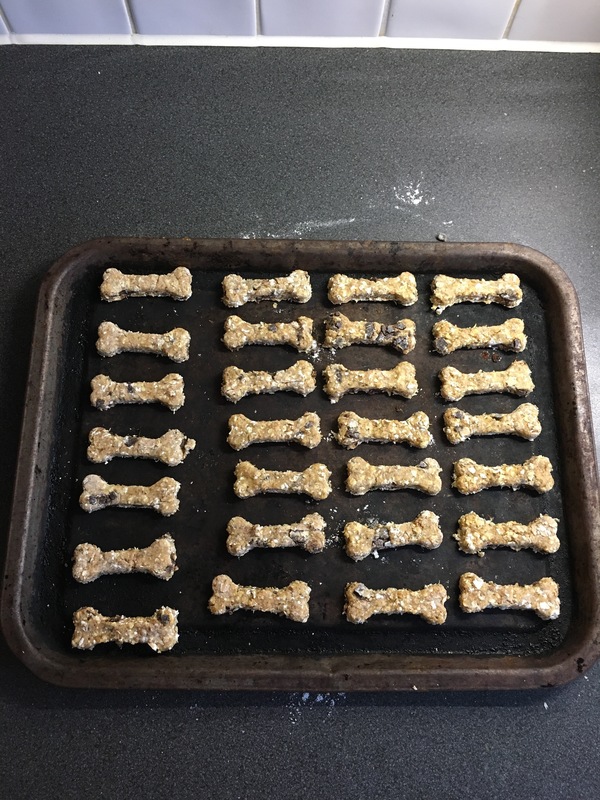 Then will scrolling down this is when I saw the “bake a bone” box and I thought this is definitely something I would like to do with Milly and Charlie. So ok Milly’s birthday was back in November and we have only just made the biscuits just due to myself being busy. 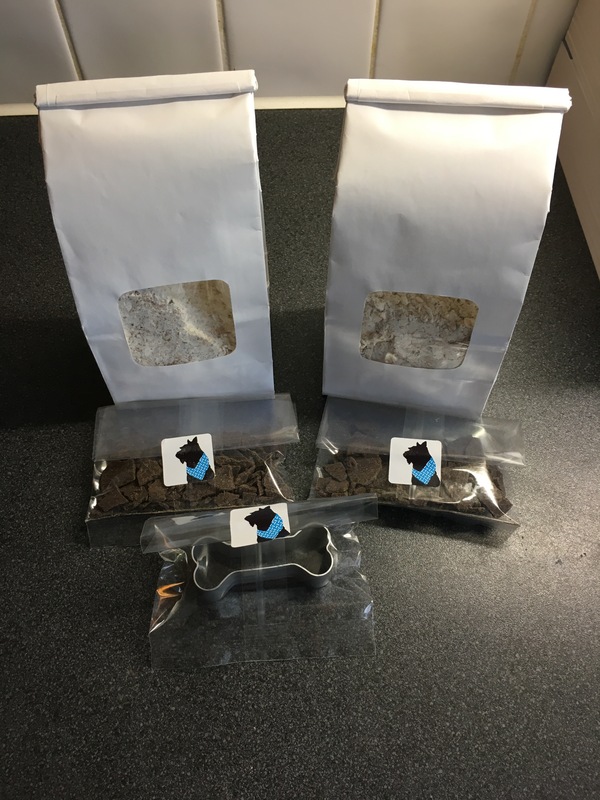 So inside the box you receive two bags for flour and oat mix, two bags of dog chocolate (this was the box I picked other favours available) a bone shape cutter and a method card. Once all cut out I placed them in the oven for 20 minutes and the dogs never left the kitchen, even my husband asked what I was cooked as it smelled so good!! I was very tempted to offer him one once cooked but thought better of it as we have only been married 4 weeks!! After 20 minutes I took the biscuits out and left them to cool down which Charlie didn’t like as he just wanted to try them. After letting them cool and Milly and Charlie waiting so nicely I let them try them and what can I say they went down a treat. They are now in a air tight box to keep fresh and we still have the other bag so we can make more biscuits very soon. 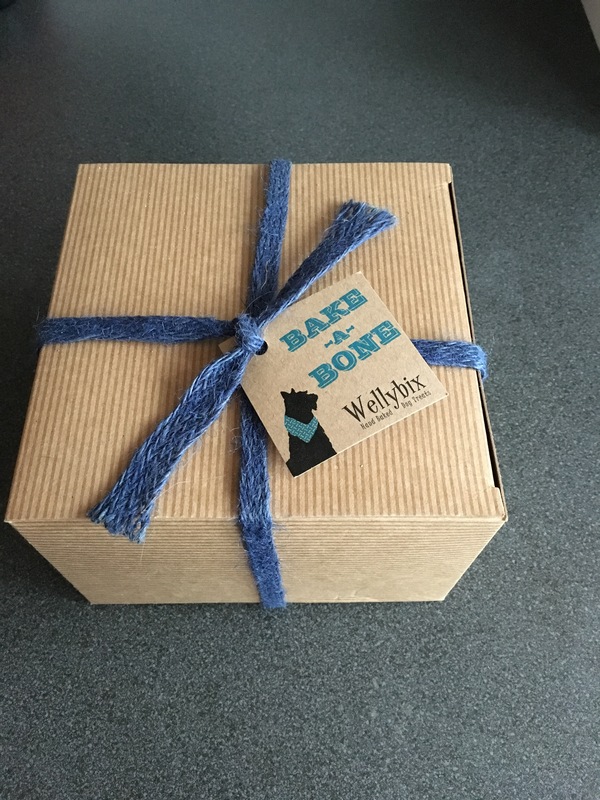 Go and check out Alison and Welly website they have some fantastic biscuits and I know will be making another order very soon as they have new flavours which I know Milly and Charlie would love to try. So Christmas is very fast approaching (sorry to be beaer of bad news) and having children myself I know there is always a dog on the Christmas list. If you are thinking of getting a dog not just as a Christmas present but anytime of the year, please think about it and answer a few questions like, do have time for a dog?, can you walk it every day?, can you afford it keep a dog?. A lot of people don’t realise how much goes into owning a dog. It’s not only the walks but buying the right food and toys and then the vets bills, flea and worm treatments and list can go on….. And there is one most important thing that still amazes me that not everyone gets and that’s Insurance!! Now you insure your house and car so why not your dog, you just never know what might happen and from personal experience I was so pleased I had insurance when my dog was taken ill. There our so many breeds of dog to choose from so its right you choose the right breed for you and your family. If you want a small low energy dog then look into a Pug or a French bulldog. 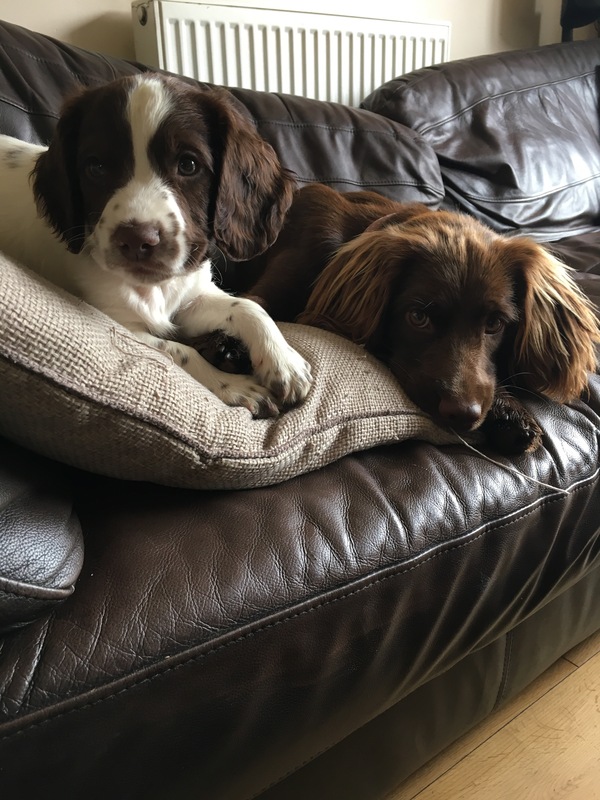 If you want something with a bit of life then look into a Spaniel (I have two Springers) or a Retriever both these breeds are fantastic family dogs, easy to training and very willing to learn. 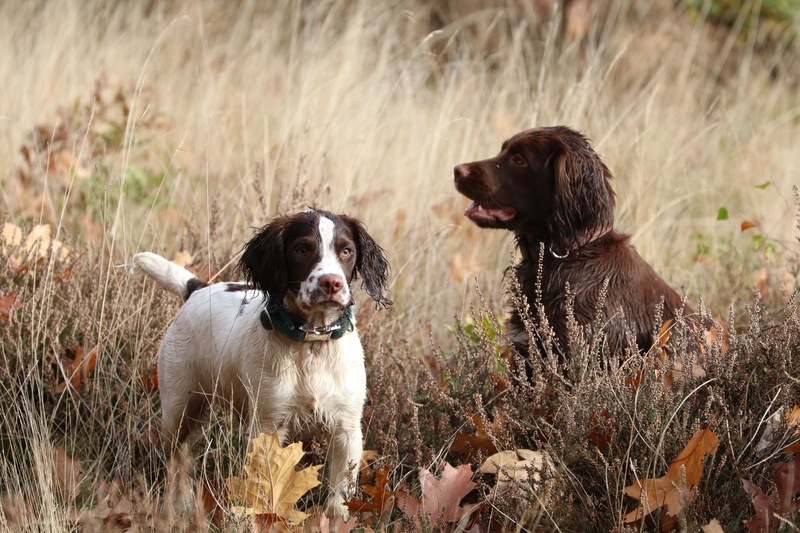 I took a long time choosing the right breed for my family and in the Springer I believe I made the right decision. 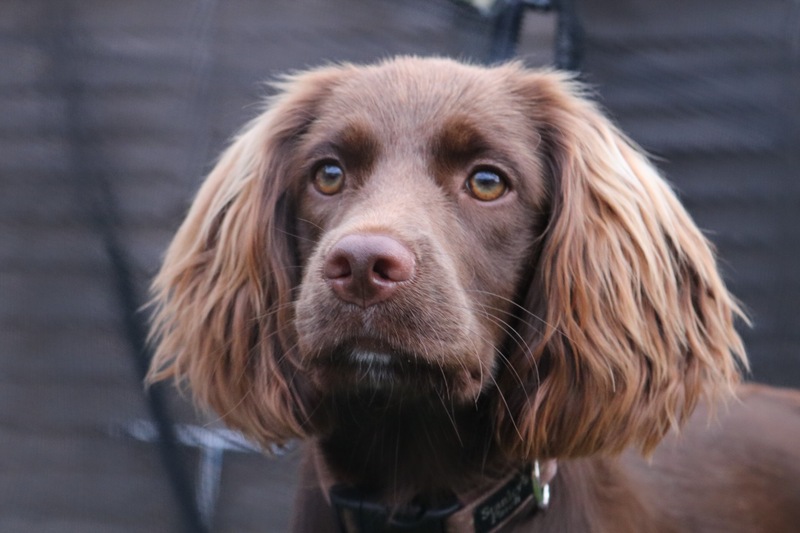 A good place to see all the different dog breeds is at http://www.kennleclub.co.uk here you can search all the breeds and also find a breeder. Please do your homework and don’t just get the first dog you see. Once you have chosen the right breed for you then it’s time to find a breeder. When looking for a breeder make sure they are registered with the kennel club this way you know you are getting a genuine dog and not someone who just wants to make money. When you visit for the first time normally when the puppies are around 3/4 weeks old ask to see the Mum and Dad dog, all good breeders will have the Mum and most of the time the Dad, if the Dad isn’t available then ask to see his papers. If the breed doesn’t have either Mum or Dad then WALK AWAY!!! When owning a dog its amazing how quickly they become a member of the family just like your own children do. With this in mind, I can never understand how many dogs on BOXING DAY are handed into the dog homes or even worse just left on the streets, the line “Dogs are for life not just for Christmas” is so true. So if there is a dog on a Christmas list this year please think about it and make sure you are making the right decision before leaving another dog in a very busy dogs home. Dogs are not an accessory they are an animal with feelings and one who will give you so much love and loyalty if treated with the love and respect they deserve. I wouldn’t be without my dogs and they come everywhere with me (where possible) and I have fantastic family and friends who I know would be happy to look after them if needed. I hope this helps if you are thinking of getting a dog. And please if younatr maybe think about rescuing one before thinking of getting a puppy. Dog fashion is getting more and more popular, there is nothing like a well dressed dog. It wasn’t until I got Milly and started up her Instagram account that I realised how big the dog fashion is with so many people with their own unique businesses, and I can now say I buy more for my dogs than I do myself or even my two boys! 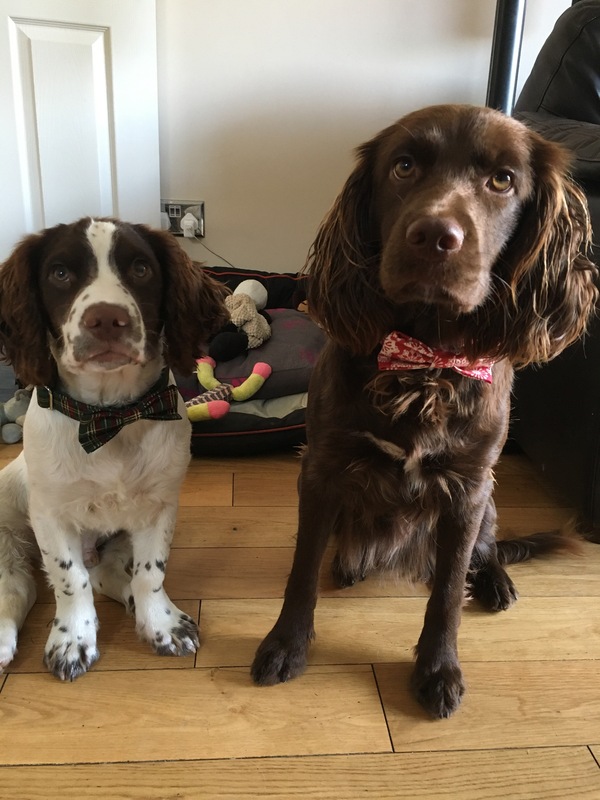 So the story behind Storeys and Tails…..Well they asked if Milly and Charlie would like to try out their collar and lead sets of which they were very happy to help out. When they arrived Milly and Charlie were very excited and couldn’t wait to try them on. 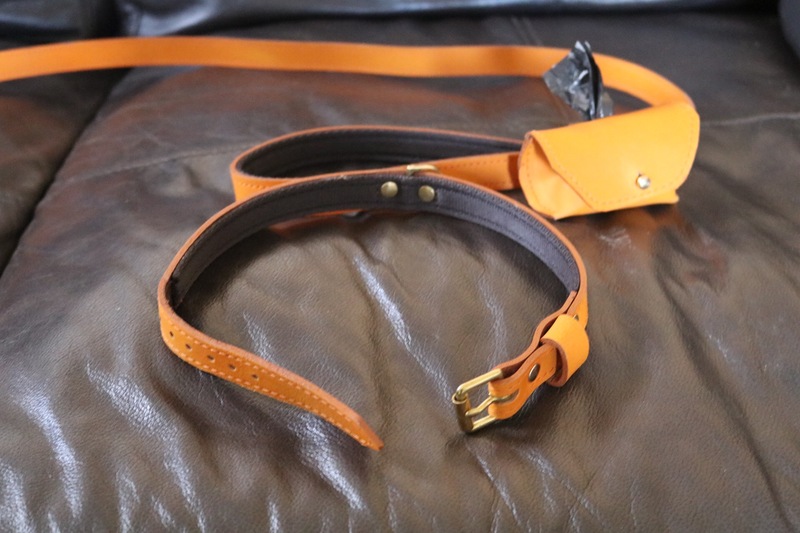 All made from English leather and finished to a very high standard and ones that I would highly recommend. The collars fitted perfectly and to make them more comfortable for your dog the collars are padded inside (they also do non padded ones). The leads are a great length and for our comfort as a padded handle too and I must say walking two dogs who can pull these leads make walking them so much nicer on my hands. These sets also came with a poo bag holder which is attached to the lead so there is no excuse to forget your bags! 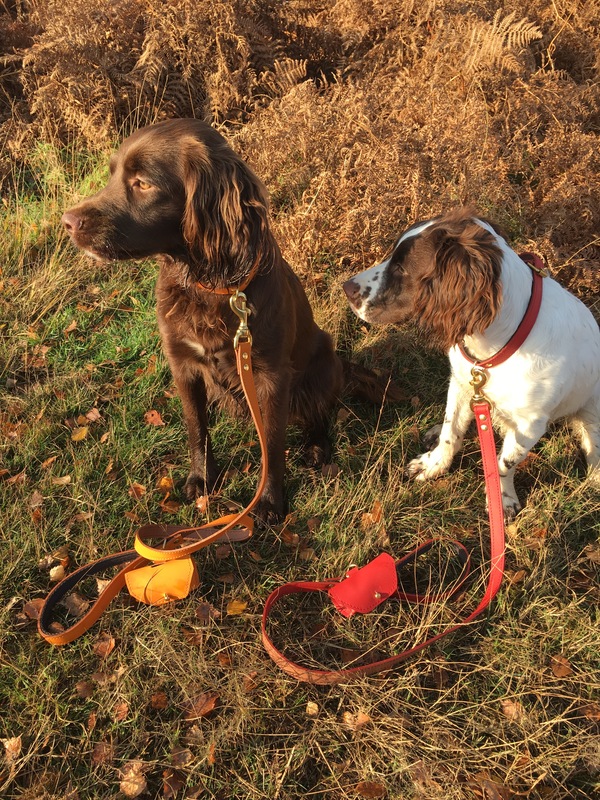 After all the lovely comments Milly and Charlie got while out on their walk today I will definitely be using these collar and leads set so much more and would be happy to recommend Storeys and Tails. 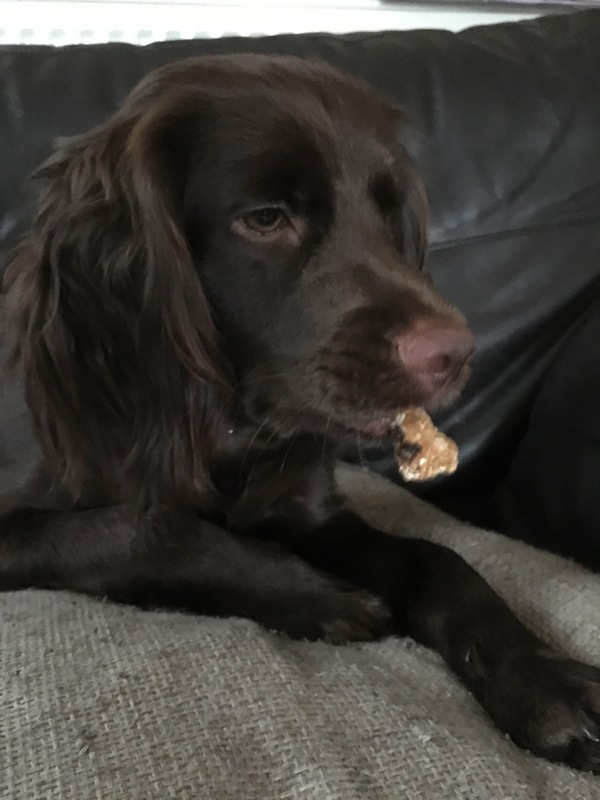 I’m Milly a year old Sussex Spaniel x Springer Spaniel and Charlie a 5 month Springer Spaniel.